The Socio-Cultural group includes scholars from the disciplines of sociology and history. We engage in scholarship to explore the social, cultural and global context of sport, exercise, physical activity, health and the body. We use a range of mostly, but not exclusively, qualitative methodologies and our research is informed by critical theories from gender studies, pedagogy, age studies, media studies, Indigenous studies, disability studies, and more. Our research spans the fields of the sociology of sport and critical disabilities studies. Using qualitative and participatory research methodologies, we explore the intersections of sport, physical activity, health, disability and social inclusion/exclusion. Our group takes a community-based, social justice approach to sport and physical culture. Primarily using the qualitative tradition, we research issues related to health, embodiment, place, gender and Indigenity. 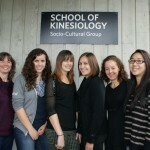 Laura Hurd Clarke’s Research Group is a sociological research team comprised of graduate and undergraduate students in the School of Kinesiology at the University of British Columbia. Together, they are conducting research focused on health, aging, and the moving body. The Physical Cultural Studies and Sport History Research Group is a part of the socio-cultural research group in the School of Kinesiology exploring a variety of topics within the area of sociology and history of sport, physical activity and the body. The Sport, Environment, Peace, Media website is a website associated with Professor Brian Wilson and students he works with in the Socio-Cultural area in the School of Kinesiology at The University of British Columbia. Featured on this website are overviews of collaborative projects that group members are working on (or have worked on), brief profiles of current and previous members of the research group, and an overview of Brian’s background and interests. The hope is that this information will be especially helpful for potential graduate students who are deciding whether to be in touch — and for those interested in the activities of our research group generally.